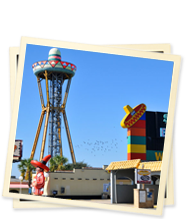 Many people have asked for a history of the South Of The Border, so with this brief story, we will attempt to tell you how it all began. In 1949, Mr. Alan Schafer built a simple 18 x 36 foot beer stand known as South of the Border Beer Depot. As it adjoined the North Carolina counties, which were dry of alcoholic beverages, business boomed. A few years later a 10-seat grill was added and the business was re-named South of the Border Drive-In. In 1954, Mr. Schafer added 20 motel rooms. Materials for the addition were shipped to “Schafer Project South of the (North Carolina) Border”. 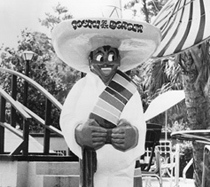 Mr. Schafer shortened the name of his business to South of the Border. One may ask, “How did Pedro come about?” Well, Mr. Schafer went to Mexico to establish import connections and met two young men. He helped them get admitted to the United States, and they went to work at the motel office as bellboys for several years. People started calling them Pedro and Pancho, and eventually just Pedro. What about those signs? They are all designed by Mr. Schafer himself. Around 175 billboards are north and south from the Virginia/North Carolina state lines to the South Carolina/Georgia state lines. (At one time there were more than 250 different billboards from Philadelphia, PA to Daytona Beach, FL.) Many of these billboards are on I-95. They are also north and south on Highway 301/501, east and west on Highways 9 & 17. There are a few billboards on I-20. The 97-foot Pedro, which stands adjacent to the Mexico Shop East and the Sombrero Restaurant, has 4 miles of wiring and weighs 77 tons. He stands 18 feet deep in solid clay. You can drive your car through the legs of the “Big Man”, as some may call it. 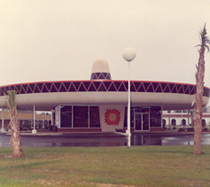 The Sombrero Restaurant is located on the same spot as the original South of the Border Drive-In. Today, for a minimum donation of $20.00 to the Shriner’s Children’s Hospital, you may get your name on an orange cardboard sombrero to be placed on the ceiling of the restaurant. South of the Border continues Mr. Schafer’s tradition of proudly matching every contribution. Many people have donated to this worthy cause over the years. “The Border”, as employees call it, has become a little town within itself. It’s unique and one-of-a-kind. Who would ever have thought Pee Dee swampland would become a multi-million dollar a year business? We hope you, your families and friends will enjoy our facilities and that you will continue to do so for many years to come.